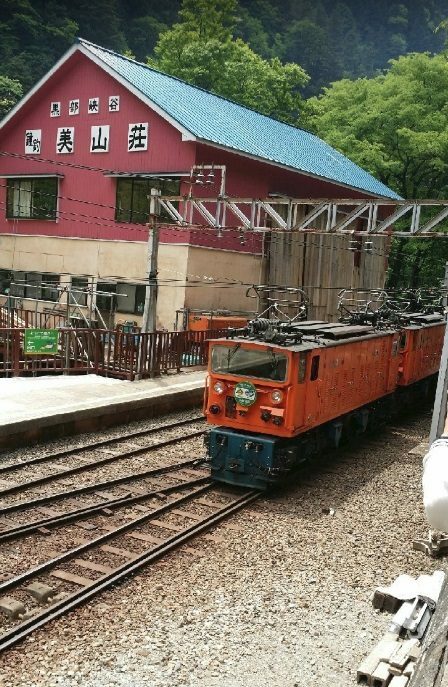 I hope this will be the first of a short series of posts looking at some of the 762mm lines in Japan. ……. En-route from Unazuki to Keyakidiara trains first cross a large red steel truss arch bridge which is shown in the adjacent picture. 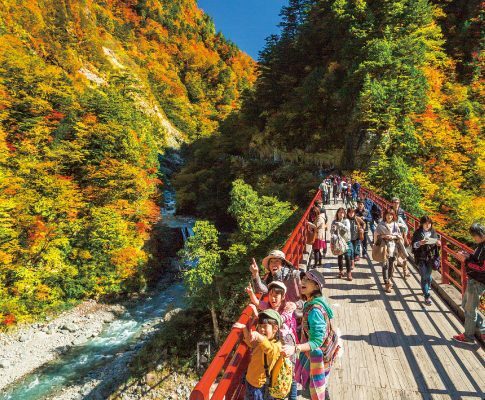 The Shin-Yamabiko (Mountain Echo Tree Spirit) Bridge. 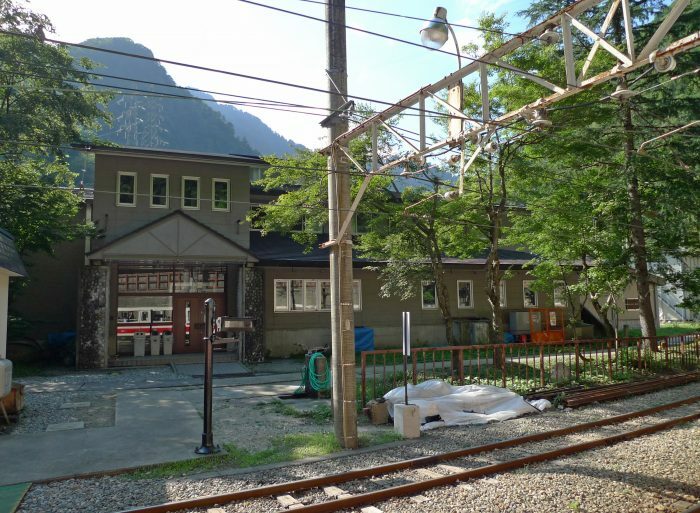 The name (yamabiko) was earned by the fact that the sound of the train passing by echoes in the town. 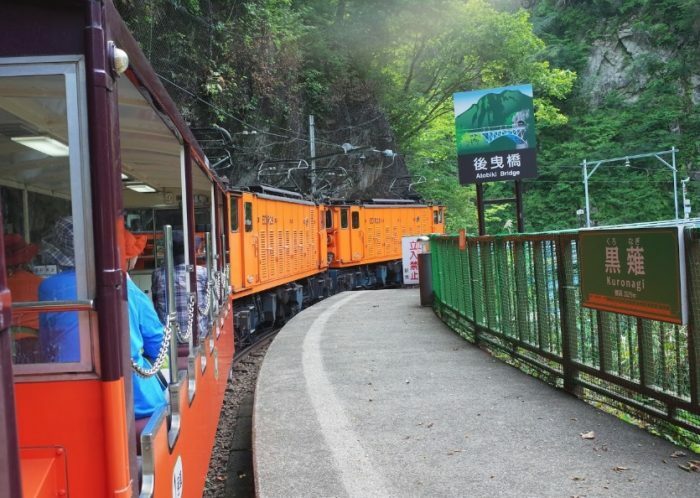 Immediately after crossing the bridge the railway enters a short tunnel before following down the eastern side of the Gorge towards Unazuki Dam. 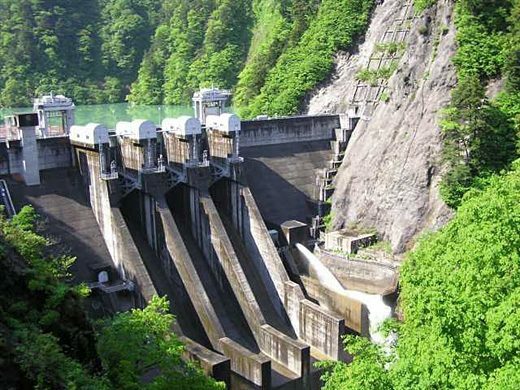 The Dam is the most recent to be built in the Gorge. It was complete in 2001. 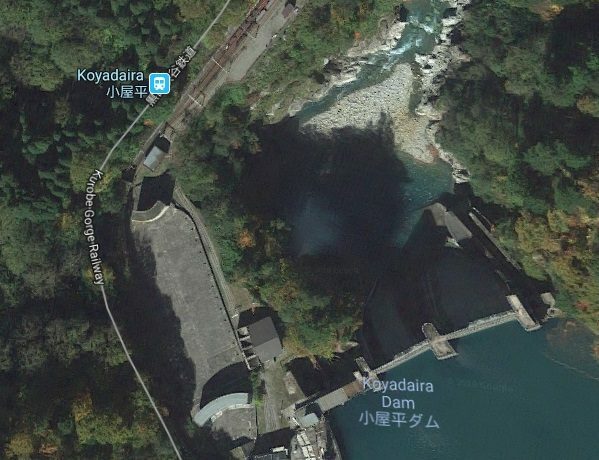 Before reaching the location of the Dam, trains plunge once again into a tunnel. 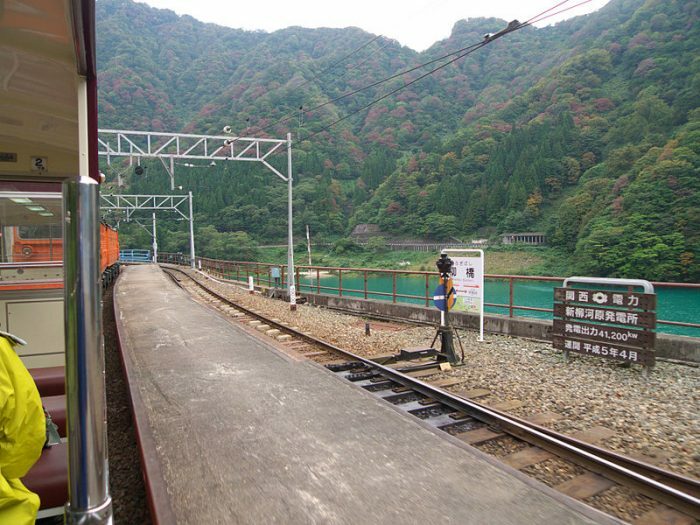 South of Nekomata, the railway continued down the East side of the Gorge. 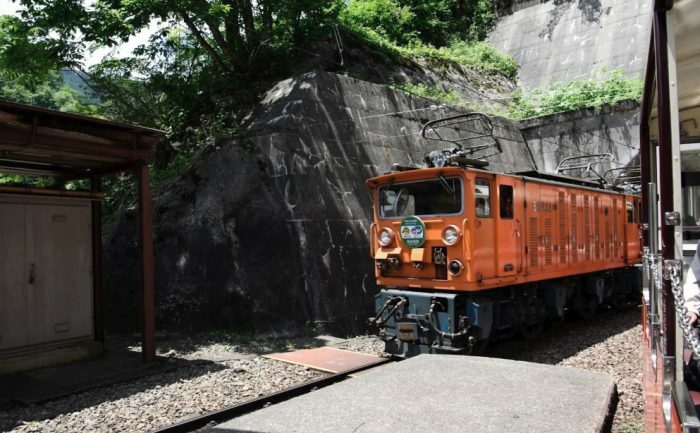 It passed in tunnel under Higashikanetsuriyama and then crossed to the West side of the Gorge. 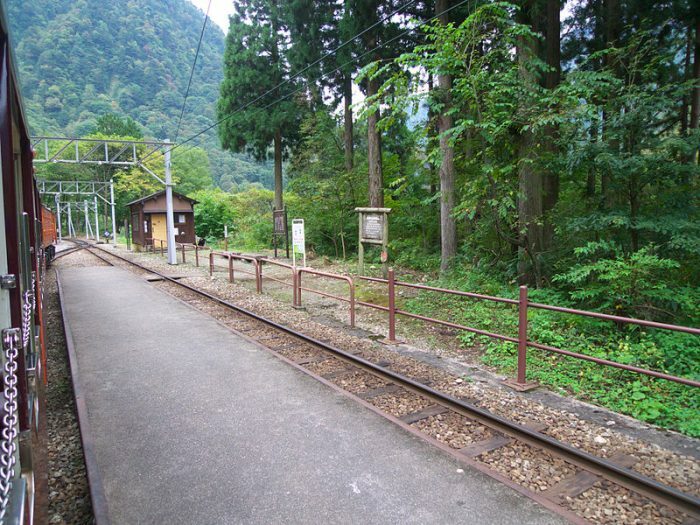 It then passed along the North flank of Nishikanetsuriyama into Kanetsuri Station which is shown in the adjacent picture. 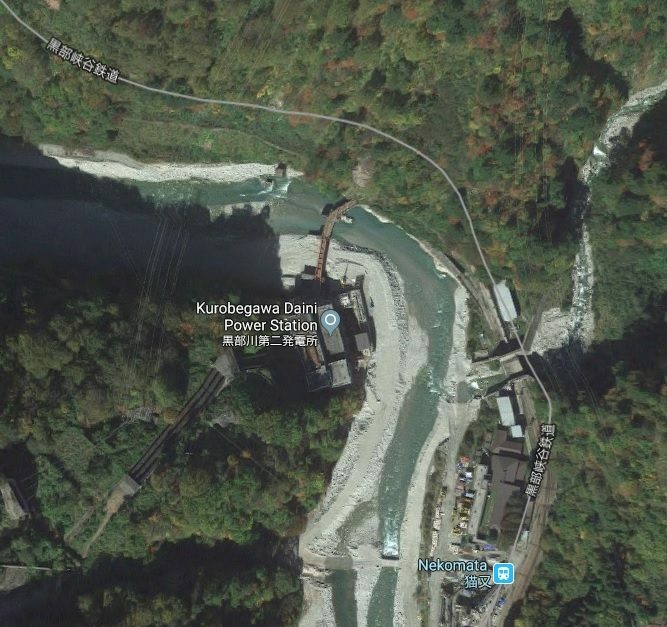 Tunnels and bridges follow, a Power Station is passed and trains eventually arrive at Keyakidaira Station, beyond which lies the Kurobegawa Daisan Power Station, the Shinkurobegawa Daisan Power Station and the Kurobe Senyō Railway which is in private hands. 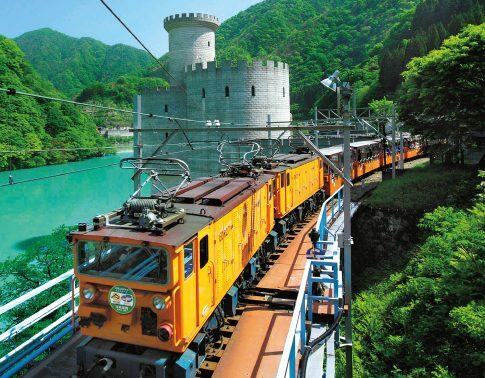 Both of the branches of the private railway provide access to power stations further along the Gorge. 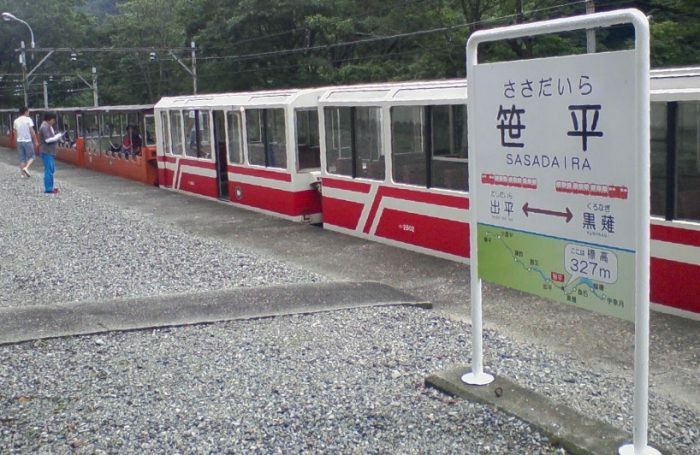 Close to the railway station lies the Keyakidaira Visitor Centre and walks up the valley of the River Babadani are possible across two significant pedestrian bridges. 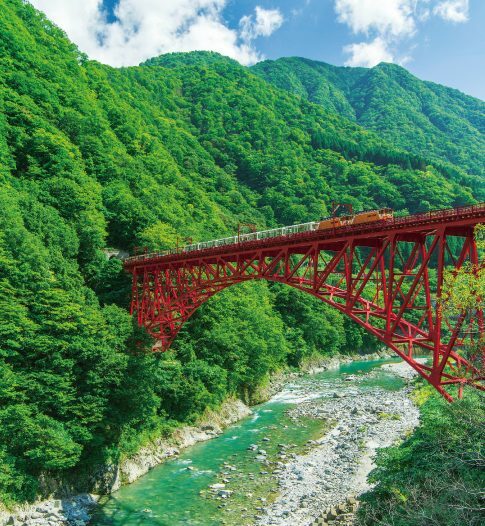 The first of these is the Okukane Bridge , a vermillion-lacquered bridge spanning the main course of the Kurobe River. 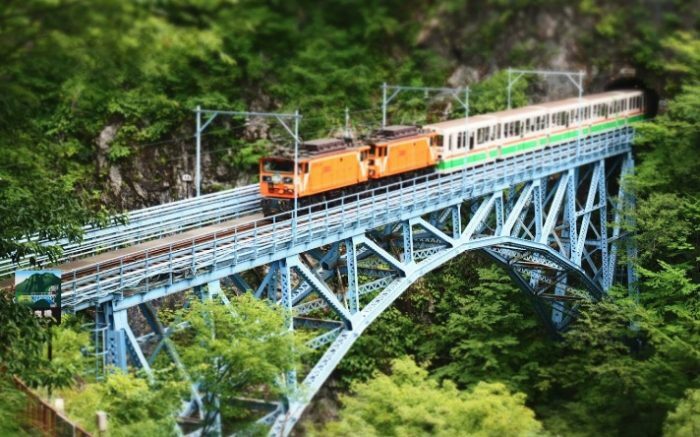 The view enjoyed from this 34-meter-high bridge is breathtaking. The second is the Meiken Bridge. 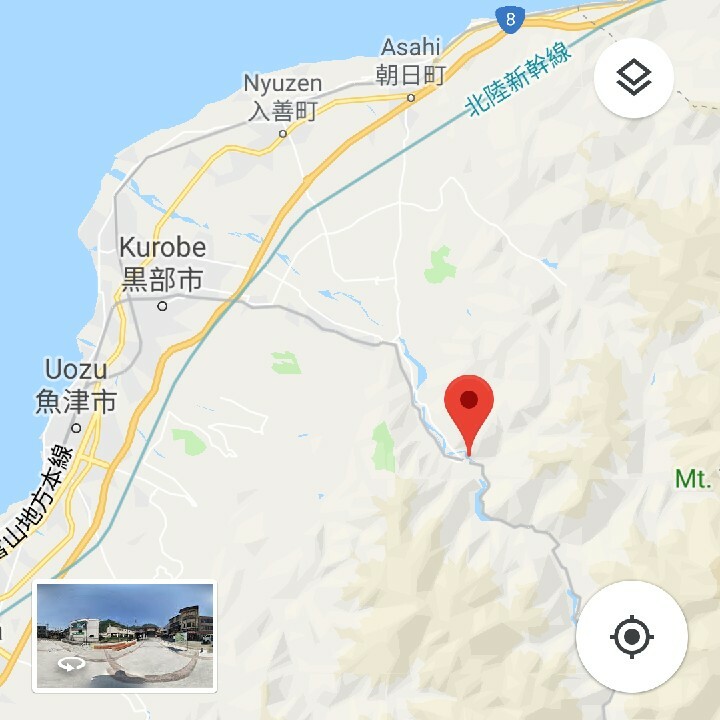 http://www.kurotetu.co.jp/en/railway, accessed on 29th January 2019. 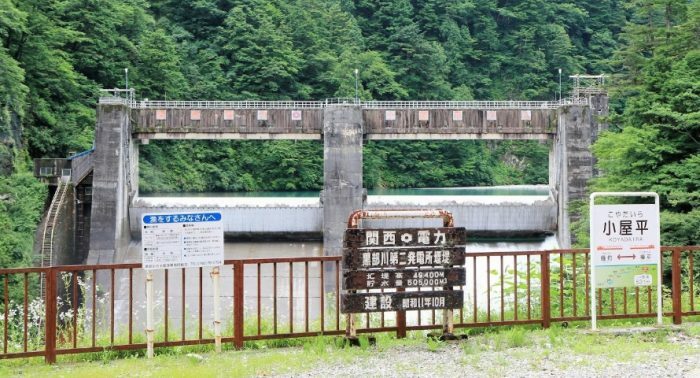 “Milestones:Kurobe River No. 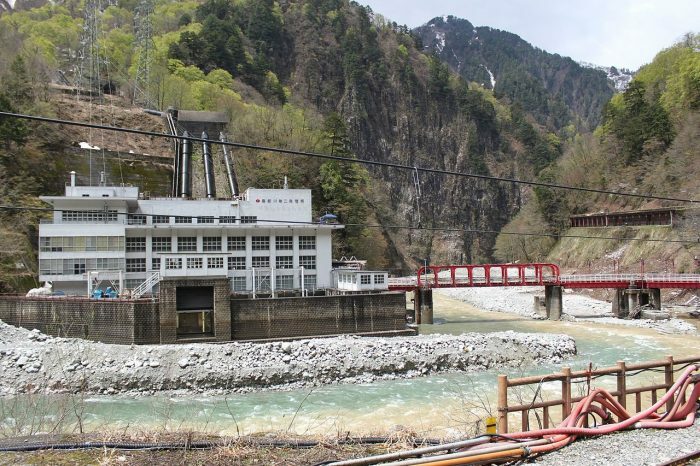 4 Hydropower Plant, 1956-63”. 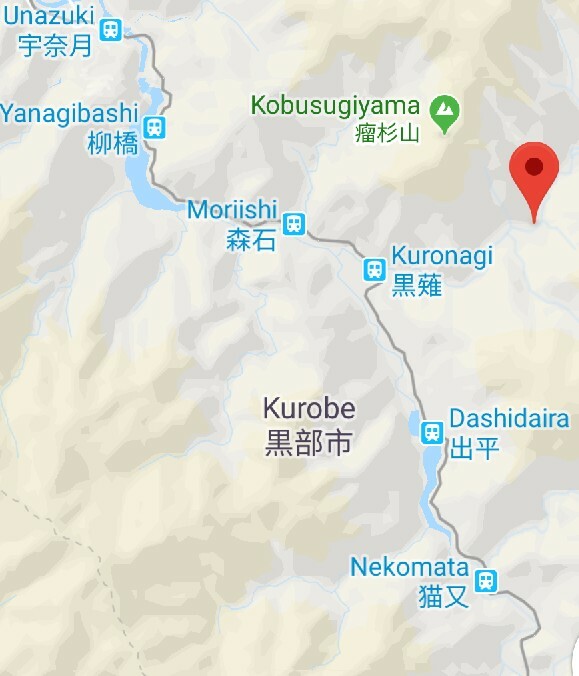 IEEE., https://ethw.org/Milestones:Kurobe_River_No._4_Hydropower_Plant,_1956-63#cite_note-refnum3-2, accessed 30th January 2019. 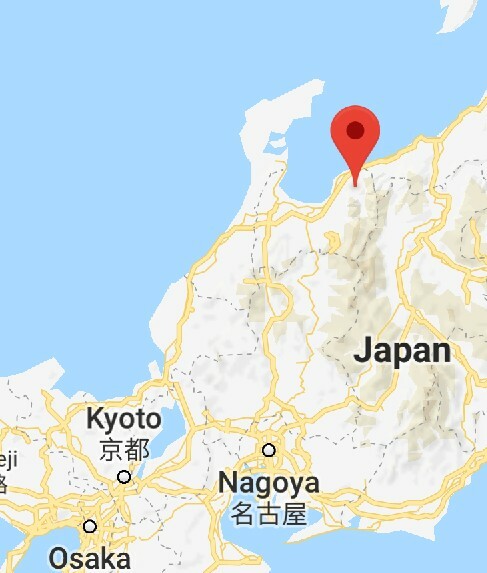 Takashi Oka; The New Japan; The Rotarian, November 1960, p. 22. https://books.google.com/books?id=ajcEAAAAMBAJ&pg=PA22&lpg=PA22&dq=Kurobe+Dam+1956#v=onepage&q=Kurobe%20Dam%201956&f=false, accessed on 30th January 2019.
https://en.wikipedia.org/wiki/Kurobe_Dam, accessed on 30th January 2019.
https://www.railway.gov.tw/Luodong/CP.aspx?SN=18164, accessed on 30th January 2019.
https://en.m.wikipedia.org/wiki/Kurobe_Gorge_Railway, accessed on 29th January 2019.
https://commons.wikimedia.org/wiki/File:Kurobe_Gorge_Railway_Yanagibashi_Station.jpg, accessed on 30th January 2019.
https://www.google.co.uk/maps/place/Moriishi+Station/@36.791973,137.613129,3a,75y,90t/data=!3m8!1e2!3m6!1sAF1QipMJgsDwRl9TskatlLFOQ5Al7t0kegupNW_ugvFC!2e10!3e12!6shttps:%2F%2Flh5.googleusercontent.com%2Fp%2FAF1QipMJgsDwRl9TskatlLFOQ5Al7t0kegupNW_ugvFC%3Dw203-h135-k-no!7i2047!8i1366!4m8!1m2!2m1!1skuronagi!3m4!1s0x5ff7b6dda3e99cc3:0xd84e8ce32d74153d!8m2!3d36.7919741!4d137.6131314, accessed on 30th January 2019.
https://www.google.co.uk/maps/place/Kuronagi+Station/@36.786557,137.625156,3a,75y,90t/data=!3m8!1e2!3m6!1sAF1QipOkkn0hQVlRu64xFzMzEiJ2FSYHND0zrvZMGgjn!2e10!3e12!6shttps:%2F%2Flh5.googleusercontent.com%2Fp%2FAF1QipOkkn0hQVlRu64xFzMzEiJ2FSYHND0zrvZMGgjn%3Dw203-h134-k-no!7i3936!8i2608!4m8!1m2!2m1!1skuronagi!3m4!1s0x0:0x22e23d0be2f09cf!8m2!3d36.7865571!4d137.6251561, accessed on 30th January 2019.
https://www.google.co.uk/maps/place/Kuronagi+Station/@36.786557,137.625156,3a,75y,90t/data=!3m8!1e2!3m6!1sAF1QipPhBsL6Awc5Diy7EsnivlU7dhhzcsFtlW_Z9_ci!2e10!3e12!6shttps:%2F%2Flh5.googleusercontent.com%2Fp%2FAF1QipPhBsL6Awc5Diy7EsnivlU7dhhzcsFtlW_Z9_ci%3Dw203-h152-k-no!7i2048!8i1536!4m5!3m4!1s0x5ff7b6fad2bee879:0x22e23d0be2f09cf!8m2!3d36.786557!4d137.625156, accessed on 30th January 2019.
https://www.google.co.uk/maps/place/Sasadaira+Station/@36.7831127,137.6237955,3a,75y/data=!3m11!1e2!3m9!1sAF1QipPMp8uldhHdgCqSUW8xn9oSxO69LrzNuiwB9zJH!2e10!3e12!6shttps:%2F%2Flh5.googleusercontent.com%2Fp%2FAF1QipPMp8uldhHdgCqSUW8xn9oSxO69LrzNuiwB9zJH%3Dw203-h152-k-no!7i1600!8i1200!9m2!1b1!2i24!4m12!1m6!3m5!1s0x5ff7b6fad2bee879:0x22e23d0be2f09cf!2sKuronagi+Station!8m2!3d36.786557!4d137.625156!3m4!1s0x5ff7b6fc6e533587:0x9b7570646a30b80!8m2!3d36.7831128!4d137.6237952, accessed on 30th January 2019.
http://damnet.or.jp/cgi-bin/binranA/enAll.cgi?db4=0881, accessed on 30th January 2019.
https://commons.wikimedia.org/wiki/File:Kurobe_Gorge_Railway_Dashidaira_Station.jpg, accessed on 30th January 2019.
https://commons.wikimedia.org/wiki/Category:Kurobegawa_No.2_Power_Station, accessed on 30th January 2019.
https://commons.wikimedia.org/wiki/File:Nekomata_Station_20100904-4.jpg, accessed on 30th January 2019.
https://www.google.co.uk/maps/place/Kanetsuri+Station/@36.7344716,137.6514835,3a,75y,90t/data=!3m8!1e2!3m6!1sAF1QipOTEI4j0pOu3Y6nOxp-Xz1hd5goGjlBBtd4sGBO!2e10!3e12!6shttps:%2F%2Flh5.googleusercontent.com%2Fp%2FAF1QipOTEI4j0pOu3Y6nOxp-Xz1hd5goGjlBBtd4sGBO%3Dw203-h360-k-no!7i720!8i1280!4m5!3m4!1s0x5ff7c872db9dfdd3:0xdddc79f34e2a53f7!8m2!3d36.7342025!4d137.6511564, accessed on 30th January 2019.
https://www.google.co.uk/maps/place/Koyadaira+Station/@36.7110379,137.6469909,3a,75y,90t/data=!3m11!1e2!3m9!1sAF1QipOCrQC47H9YO-fpqq_DzKa1X32a6OYC1C7Ma_1Y!2e10!3e12!6shttps:%2F%2Flh5.googleusercontent.com%2Fp%2FAF1QipOCrQC47H9YO-fpqq_DzKa1X32a6OYC1C7Ma_1Y%3Dw129-h86-k-no!7i2592!8i1728!9m2!1b1!2i20!4m5!3m4!1s0x5ff7c635e0932073:0xb92346a137017734!8m2!3d36.7110379!4d137.6469909, accessed on 30th January 2019.
https://en.m.wikipedia.org/wiki/Kurobe_Seny%C5%8D_Railway, accessed on 30th January 2019. 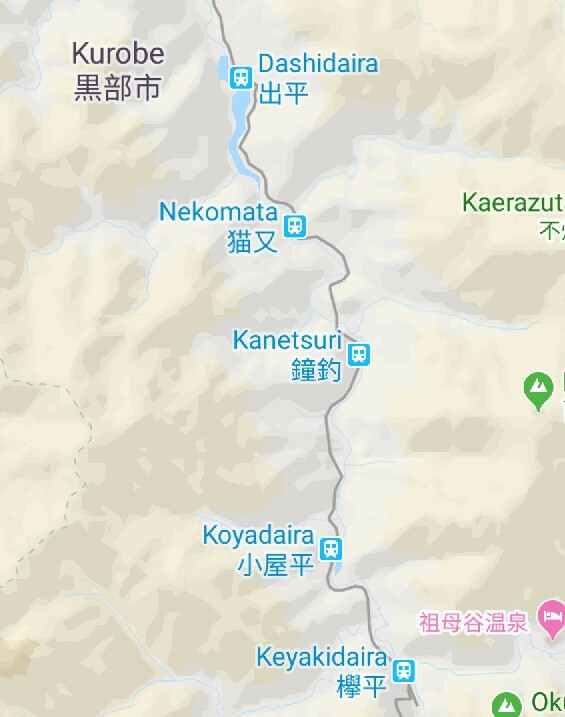 This entry was posted in Japanese Railways, Railways Blog on January 30, 2019 by rogerfarnworth.